When it comes to audio players, most people choose between the three or four most popular apps: iTunes, Winamp, VLC, AIMP Player… but there are many other interesting choices like Songbird. Songbird is an open-source music player and organizer with which you can manage, play and discover music. It's free, cross-platform, highly customizable thanks to a wide variety of plug-ins and can be improved and extended by the contribution of its user community. The first thing you'll notice about Songbird is its resemblance to the iTunes interface, which means that if you've ever used iTunes you won't have any problem in learning how to use Songbird. Then, as you explore the program's menus and options, you'll start discovering all the goodies it has to offer. Songbird automatically imports your music files from a selected folder, monitors that folder for future music additions, organizes your music in a handy, easily browsable catalog, is compatible with iTunes and Last.fm libraries, can be controlled from any other app thanks to global hotkeys and also supports Last.fm scrobbling. It also includes album art and a simple equalizer. Songbird is such a complete tool that's hard to find negative sides to it. Plus there's an army of developers constantly working on improvements and new features. The only thing I missed so far, in fact, is support for podcasts – which I'm sure will probably be added some time soon. 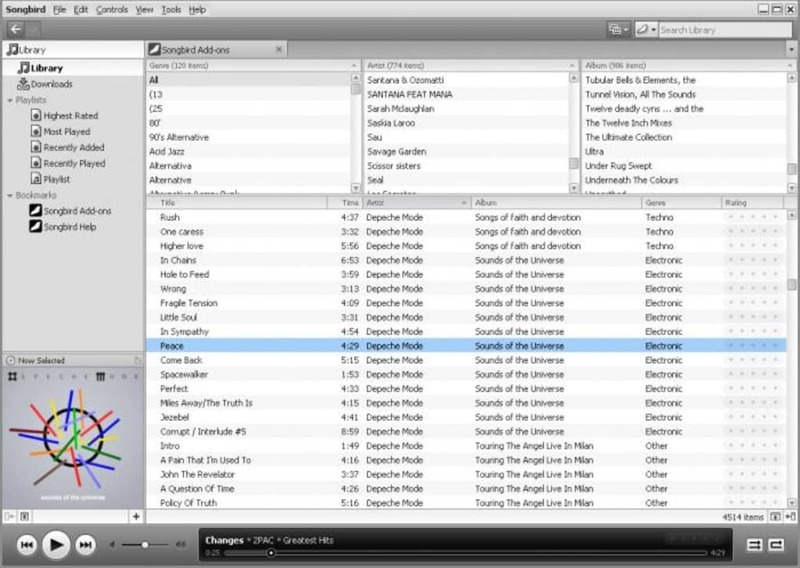 Songbird is a complete, full-featured music player and organizer with support for plug-ins and an extensive user community. Enjoyable!. I love my Songbird &amp; listen to. it everyday while working. A Lot Of Untapped Potential. Songbird was supposed to be the Firefox of Audio Players but is has a lot of untapped potential. Some of it has to do with lack of add-on support and the fact while it's basic jukebox audio player is nice, it does lack out of the box features already implimented in similar audio players such as MediaMonkey. The downsides to Songbird is the fact while it does have add-ons and themes they are just too basic and the Songbird is just too limited feature wise out of the box to compete with other alternatives such as MediaMonkey. I recommend everyone keep trying Songbird just simply to see if it ever reaches it's potential and truly becomes the Firefox of Audio Players. Until then your better off sticking to programs like MediaMonkey. Songbird – our new favorite Android music player!